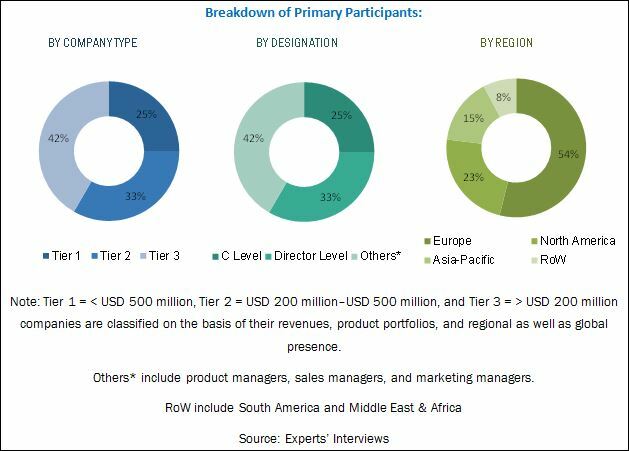 [162 Pages Report] The Global PVC Additives Market was valued at 2.88 Billion in 2015 and is projected to reach 4.08 Billion by 2021, at a CAGR of 6.0% from 2016 to 2021. In this report, 2015 is considered as the base year and the forecast period is from 2016 to 2021. Asia-Pacific is the fastest-growing market for PVC additives due to the high production and consumption of PVC in this region. Increase in infrastructure activities and the replacement of conventional materials such as steel, concrete, and iron with lightweight plastics are factors driving the growth of the PVC additives market. Key manufacturers of PVC additives includes Kaneka Corporation (Japan), Arkema S.A. (France), BASF SE (Germany), Songwon Industrial Co., Ltd. (South Korea), Akzo Nobel N.V. (Netherlands), Adeka Corporation (Japan), and Clariant AG (Switzerland). This report categorizes the global PVC additives market on the basis of type, fabrication process, application, and region. The global PVC additives market was valued at USD 3.05 Billion in 2016, and is projected to reach USD 4.08 Billion by 2021, at a CAGR of 6.0% during the forecast period. 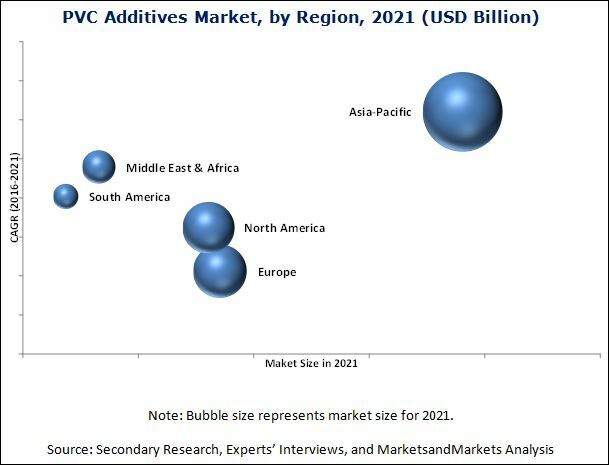 The replacement of conventional materials with PVC and the high demand for additive-based PVC are factors anticipated to drive the growth of the global PVC additives market. On the basis of type, the global PVC additives market has been classified into stabilizers, impact modifiers, processing aids, lubricants, plasticizers, and others. The stabilizers segment is expected to lead the global PVC additives market during the forecast period, followed by the lubricants segment. The stabilizers segment is anticipated to grow at the highest CAGR between 2016 and 2021, owing to the increasing usage of stabilizers in pipes & fittings, rigid & semi-rigid films, window profiles, wires & cables, medical, and consumer goods, among other applications. Based on fabrication process, the global PVC additives market has been segmented into extrusion, injection molding, and others. The extrusion segment is expected to be the fastest-growing fabrication process segment, owing to the increase in manufacturing of high volumes of extruded PVC at minimal cost. Based on application, the global PVC additives market has been segmented into pipes & fittings, profiles & tubing, rigid sheet & panel, wires & cables, bottles, and others. The pipes & fittings segment is the fastest-growing application segment of the global PVC additives market. PVC additives are widely utilized in PVC pipes & fittings, due to the rising demand for the replacement of conventional concrete, iron, and steel-based pipes & fittings with PVC pipes in the building & construction industry. On the basis of region, the global PVC additives market has been classified into Asia-Pacific, Europe, North America, the Middle East & Africa, and South America. The Asia-Pacific region is the largest market for PVC additives. Rapid industrialization and improved living standards are factors anticipated to drive the increasing demand for PVC additives in this region. In addition, the increasing applicability of PVC additives in the building & construction industry is further expected to drive the growth of the Asia-Pacific PVC additives market. One of the major factors restraining the growth of the global PVC additives market is the low R&D expenditure in emerging markets, which impacts the quality of PVC additives. Some of the key players operating in the global PVC additives market include Kaneka Corporation (Japan), Arkema S.A. (France), BASF SE (Germany), Songwon Industrial Co., Ltd. (South Korea), Akzo Nobel N.V. (Netherlands), Adeka Corporation (Japan), Clariant AG (Switzerland), Pau Tai Industrial Corporation (Taiwan), Baerlocher GmbH (Germany), and Shandong Ruifeng Chemical Co., Ltd. (China), among others. 11.4 Songwon Industrial Co. Ltd.
11.10 Shandong Ruifeng Chemical Co. Ltd.